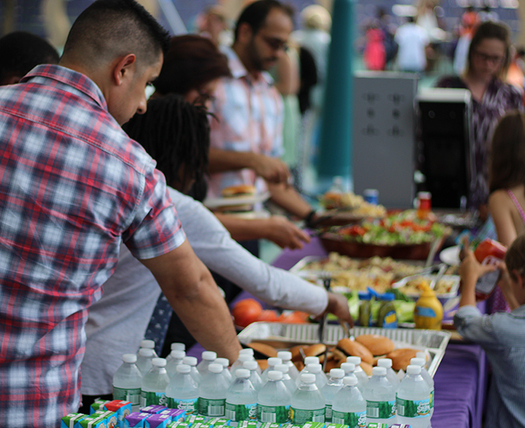 NORWALK, CT - Nothing says summer like a family picnic with tasty food, sensational sunshine and outdoor games! On Saturday, July 14 from 11:00 am – 3:00 pm, Stepping Stones Museum for Children is hosting its first ever Farmers and Friends Family Picnic, packed with a basketful of games and activities. Bring the whole family for a fun-filled, outdoor extravaganza and learn how easy and delicious it can be to make healthy choices and eat locally sourced foods. During the picnic, which will be held in the Gullquist Family Celebration Courtyard, the award-winning children’s museum will host its very own Farmer’s Market featuring vendors with samples from local restaurants, farms, and stores. Families are also invited to explore the museum and tour the Edible Garden to learn how to grow organic food and much more! “Lettuce” teach you how easy – and delicious – it can be to maintain a nutritious, balanced diet with healthy foods grown close to your home. Tickets are available at www.steppingstonesmuseum.org/picnic and include museum admission for the day. Adult tickets are $40 for members and $45 for non-members. Tickets for children under 18 are $20 for members and $25 for non-members. Space is limited, so advanced registration is highly encouraged. Proceeds from the Farmers and Friends Family Picnic will support the Norwalk Foodshed Initiative at Stepping Stones. The Foodshed Initiative supports equal access to fresh and healthy foods, nutrition and wellness education, and sustainability in the greater Norwalk area. Stepping Stones has gathered many organizations, from grocery stores to food pantries, to coordinate efforts to support residents, schools and businesses by making nutritious food affordable and reducing waste. Vendors are invited to share samples of local food and organic goods at a small Farmer’s Market in our Celebration Courtyard. All products must be approved in advance and any vendors selling merchandise must also provide free samples. There are still a few tables available in this Farmer’s Market. Providing important sponsorship support for the Farmers and Friends Family Picnic are: Carmody, Torrance, Sandak & Hennessey LLP; Choice Pet; Copps Island Oyster; Diserio, Martin, O’Connor & Castiglioni LLP; and Redniss & Mead with additional support from Subway. Additional sponsorship opportunities are still available. For information about tickets, event sponsorship and/or vendor table prices, which will include the health department permit fee, please contact Linda McDonals at (203) 899-0606, ext. 246 r visit www.steppingstonesmuseum.org/picnic.